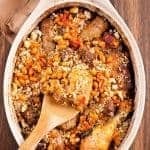 Flavored with garlic, white wine and thyme, our version of this classic French casserole is made with chicken legs, cubed pork, white beans and sausage. Place the beans in a large saucepan and add enough water to cover by about one inch. Bring to a boil over high heat and cook for 15 minutes. Remove from the heat, cover, let stand for 4 hours, drain and place in a large bowl. Fry the bacon in a large, heavy skillet until crisp. Transfer to paper towel-lined plate and set aside. Drain all but 2 tablespoons of the fat from the pan. Season the chicken with salt and pepper and, working in batches, brown the pieces over medium-high heat, about 3 minutes per side. Transfer the chicken to a large platter and set aside. Season the pork with salt and pepper, add to the pan and brown on all sides, about 4 minutes total. Transfer to the platter with the chicken. Last, brown the sausages and transfer to the platter with the chicken and pork. Drain all but 2 tablespoons of fat from the pan, reduce the heat to medium and add the onion and carrots. Saute until the onion is lightly caramelized and the carrots are crisp-tender, 3 to 4 minutes. Add the garlic and continue cooking for 1 minute more. Stir in the tomatoes, thyme leaves and bacon and season to taste with salt and pepper. Add the entire mixture to the beans and combine well. Spoon half of the bean mixture into a large, greased casserole dish. Arrange the chicken, pork and sausages on top and place a bay leaf in the center. Top with the remaining beans and another bay leaf. Whisk the wine, chicken broth and tomato paste together in a small bowl. Pour evenly over the casserole, cover tightly and bake for 3 hours. Combine bread crumbs, garlic, parsley and melted butter in a small bowl. Uncover the cassoulet and spread the crumb mixture over the top. Return to the oven, raise the temperature to 425°, and bake until the crumbs are golden brown, 10 to 15 minutes.